Funfetti Oreo Icebox Cake and a DIY Cake Stand! - Home. Made. Interest. 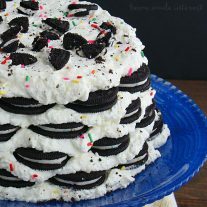 Home » Recipes » Desserts » Funfetti Oreo Icebox Cake and a DIY Cake Stand! This Funfetti Oreo Icebox Cake is an easy no bake cake recipe made with layers of whipped cream and Oreos. Guess what guys, today is my birthday! Yep that’s right, 29 again! Can you believe it? Birthdays are a big deal around my house. It’s your own special holiday and sometimes our celebrations last a whole week. This year is no exception and I can’t wait to spend time with friends and family, even if it means I have to get a little bit older ;). One of the many benefits of being a food blogger who works with their best friend is that I always know I’m gonna get a really yummy cake. This year Melinda hit the nail on the head with this awesome no bake Funfetti Oreo Icebox Cake. 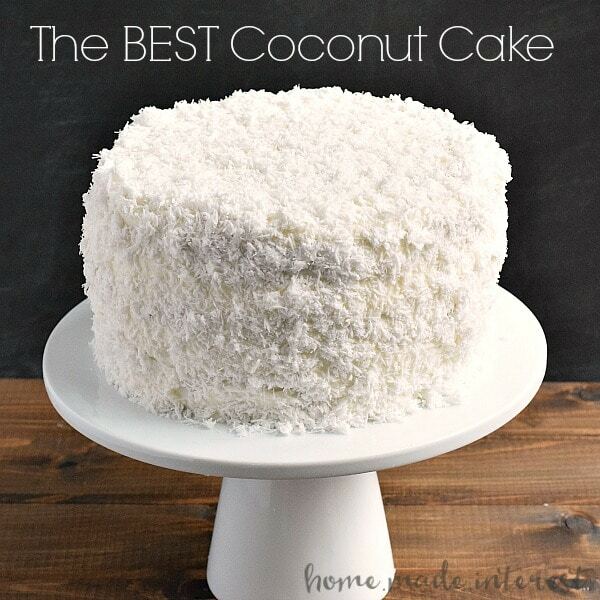 It’s really simple but oh so good and honestly, I couldn’t have thought of a better cake. Because this was for my birthday, and I have the best friend ever, she also made me a beautiful DIY cake stand as a gift. I like it so much that I made her recreate the steps so we could share how to make it with you guys. It’s a really simple DIY. She used a clear glass plate (this is important!) and candlestick that she found at the thrift store. 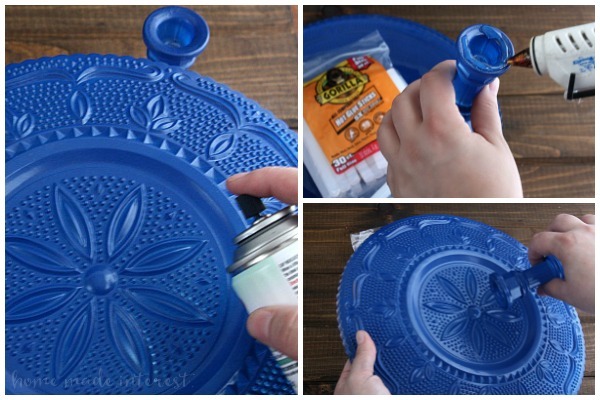 It was important that the plate was clear glass because she knew she wanted to spray paint it to give it a custom color but she didn’t want to have to spray paint the top of the plate because food would be touching it. So, she cleaned both the plate and the candlestick thoroughly with soap and water, and then gave them a quick wipe with rubbing alcohol to remove any oils. Then she flipped the plate over so the bottom side was face up and she spray painted it, and the candlestick, navy blue. To get a nice, even, coating of paint make sure you spray it in several light layers of paint until it is thoroughly covered. Once everything was dry she flipped the plate back over and, since it was clear, the color showed through the plate. It is beautiful and I don’t have to worry about paint touching my food! Once the candlestick and plate were dry it was just a matter of gluing the two pieces together and you know Melinda used hot glue. We use that stuff for all of our projects! We recently discovered Gorilla Hot Glue Sticks at Walmart and it is pretty awesome. Gorilla Hot Glue Sticks is extremely versatile and can be used with a high or low temperature glue gun. The high temperature creates strong bonding for wood, plastic, metal, glass, etc. and the low temperature is perfect for more delicate projects using foam, fabric, floral pieces, and more. 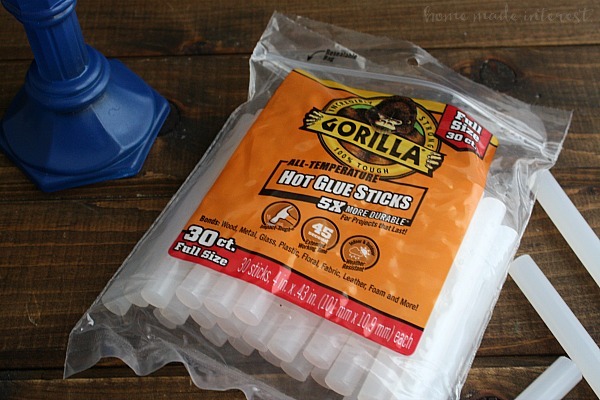 Gorilla Hot Glue has a 45 second extended working time which is pretty awesome if you’re like me and usually have to shift something around and it is weather resistant so you can use it for indoor and outdoor projects. You can only find it at Walmart and if you enter the Gorilla Hot Glue Sticks Giveaway you could win a $250 Walmart Gift Card! That’s a lot of glue sticks! Now on to the cake! Anyone who knows me knows I am kind of an Oreo addict. They are my go to cookie and when a new flavor comes out I have to try them! This cake is made up of layers and layers of homemade whipped cream and Oreo cookies, birthday cake flavor Oreos this time around but you could use any flavor your like. Once the layers are done you put the whole thing in the refrigerator for at least 3 hours, overnight if possible. The cookies get soft and when it’s time to celebrate you can cut the cake into slices just like a regular cake. I was in heaven! I couldn’t have come up with a better gift if I tried. I mean who doesn’t want a cake stand complete with it’s own Funfetti Oreo Icebox Cake on top?! She’s set the bar pretty high for Christmas this year! 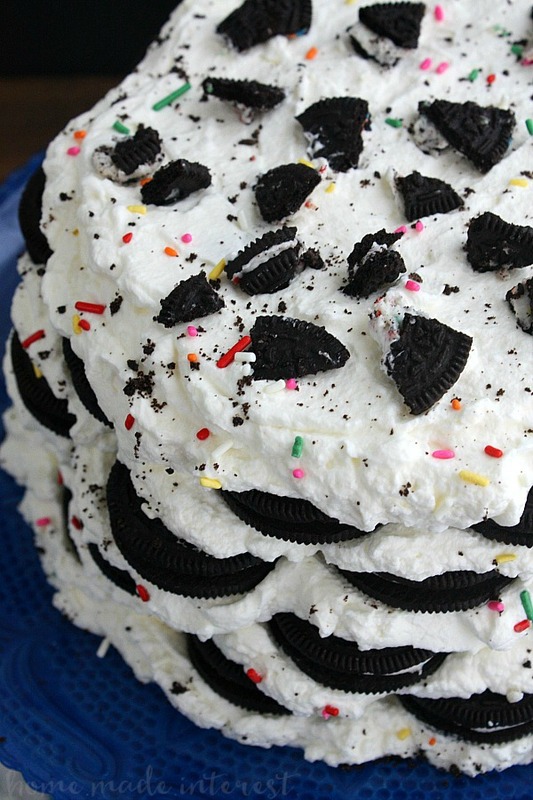 This Funfetti Oreo Icebox Cake is a no bake cake made with layers of whipped cream and Oreos. Make your whipped cream by placing the heavy cream in the mixing bowl of your stand mixer and whisking on high until it forms soft peaks. Add powdered sugar and vanilla and continue whisking until the whipped cream has stiff peaks. 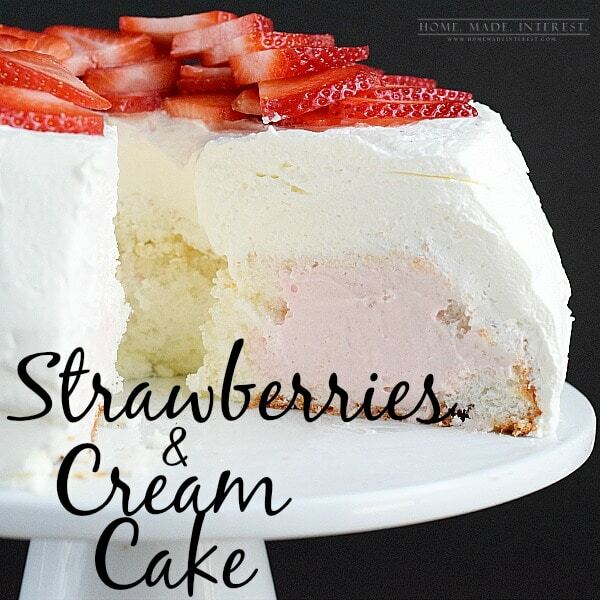 Start with a layer of whipped cream on your cake plate. Press a payer of Oreos into the whipped cream. 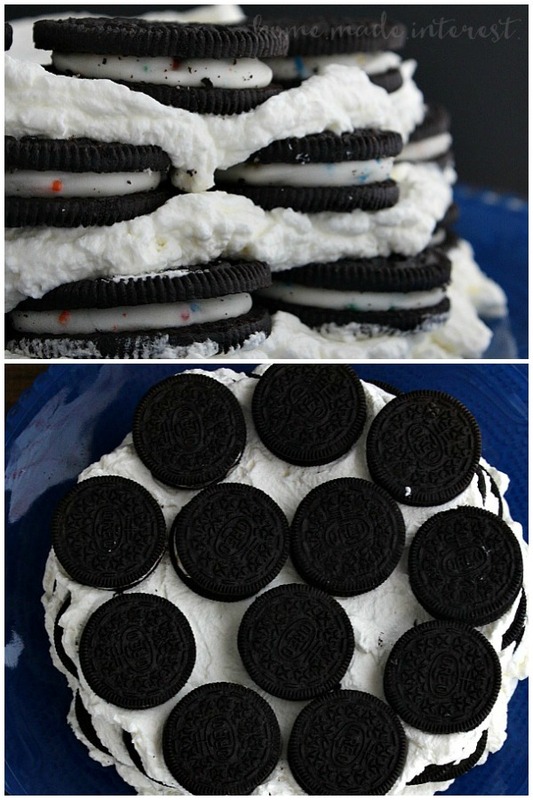 Top with another layer of whipped cream, then Oreos, continuing the layers until you have used up your Oreos. Finish with whipped cream on top. Place in the refrigerator for at least 3 hours, preferably over night. Dust with sprinkles before serving. this is, like, the craziest thing i have ever seen and i NEED to have some. yum! Definitely one of the coolest b-day cakes! And it’s so easy to make! I’d love to add a drizzling of chocolate syrup! Or magic shell! Sounds so good. Now that’s a cake! My family would devour this! ???? WOAH that looks good! Pinning for later! Your cake stand is wonderful! And the cake looks awesome too! I plan to try this toon. It looks yummy. Keep the cool recipes coming!